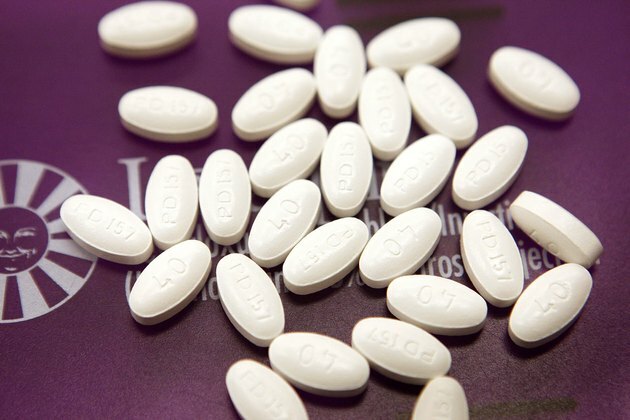 Lipitor is the brand-name of the medication atorvastatin, a member of a class of drugs known as statins that are used to treat high cholesterol. Coenzyme Q10, a compound similar to vitamins in its effects, is required for numerous biochemical processes in your body. The effects of Lipitor and coenzyme Q10 are linked, and the two compounds have a complex relationship. You should consult your doctor regarding taking Lipitor and coenzyme Q10 at the same time. Lipitor and the other statin drugs function as HMG-CoA reductase inhibitors, which means they block the function of an enzyme called HMG-CoA reductase, which is required to synthesize cholesterol. This enzyme is involved in synthesizing both cholesterol and coenzyme Q10, according to the Linus Pauling Institute. Statins often cause several side effects as a result of inhibiting HMG-CoA reductase, including muscle pain, fatigue, nausea, vomiting, diarrhea, constipation, headache, flulike symptoms and allergic reactions. Because Lipitor inhibits HMG-CoA reductase, which is required by your body to synthesize coenzyme Q10, taking Lipitor decreases you coenzyme Q10 levels. Even brief exposure to Lipitor reduces your coenzyme Q10 levels, according to the June 2004 issue of "Archives of Neurology." However, Lipitor also lowers the levels of cholesterol and other lipids, and the activity of coenzyme Q10 is tightly linked to lipids. You body requires coenzyme Q10 for several critical biological processes, including the production of energy within cells. Before they can use the energy from food, cells must convert carbohydrates into a molecule called adenosine triphosphate, or ATP. Coenzyme Q10 is required for the biochemical reaction that produces ATP. Some researchers speculate that the side effects of fatigue and muscle pain caused by Lipitor and other statins may result from the lowered levels of coenzyme Q10 caused by statins, according to the June 2007 issue of the "Journal of the American College of Cardiology." However, this hypothesis must be tested before it can be accepted as fact. Preliminary evidence suggests that coenzyme Q10 supplements may decrease some of the side effects caused by Lipitor and other statins, particularly the symptoms of muscle pain and fatigue. Additional large-scale studies are needed to conclusively confirm this finding. If you take coenzyme Q10 to treat other health conditions, taking Lipitor may decrease its effectiveness in these conditions, explains the National Cancer Institute.